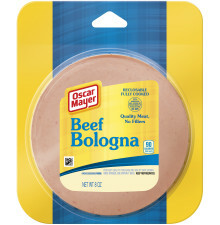 Oscar Mayer Beef Bologna is made with quality meat and great taste. Light Beef Bologna is perfect for an easy meal or snack! 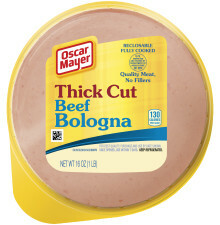 BEEF, WATER, CORN SYRUP, MODIFIED FOOD STARCH+, CONTAINS LESS THAN 2% OF SALT, POTASSIUM LACTATE, SODIUM PHOSPHATES, POTASSIUM CHLORIDE, SODIUM DIACETATE, SODIUM ASCORBATE, FLAVOR, SODIUM NITRITE, GROUND MUSTARD SEED, HYDROLYZED BEEF STOCK, AUTOLYZED YEAST, DEXTROSE, EXTRACTIVES OF PAPRIKA, SODIUM LACTATE, DRIED GARLIC, CELERY SEED EXTRACT. 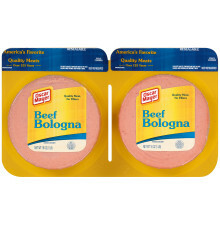 +EXCEEDS AMOUNT PERMITTED IN REGULAR BOLOGNA.